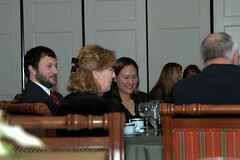 Last Saturday evening, Angela and I drove to Virginia Beach to attend the company-wide Christmas Party. We had most of the Virginia Beach and Richmond officesin attendance for a great dinner and the chance for us all to hang out outsid eof the office. Scott Gutierrez, our company IT-man, also happens to be talented photographer and was on hand to take lots of photos. He’s very good at taking both staged and candid shots with his big Nikon SLR. Just as cool, he’s started a Flickr account for the company, with photos from the party as well as the construction of their new offices (he’s located in the VA Beach office). After the dinner party, some of us headed over to Murphy’s Irish Pub down the street to catch a few beers before heading to bed. It was loud and smokey, but a few of us sat around and caught up, which is always nice. Oh, and Scott, call her Angela if you know what’s good for you, man. Believe it or not but I grew up in Virginia Beach! My dad was in the Navy for 20yrs, out in Norfolk, and those were magical times for my family. The ships would be all decorated with lights during the Christmas season, it was wonderful. What I miss the most about living on the coast was the abundantly cheap seafood! We use to boil buckets of crabs during summers, but here in the Midwest it’s not so available. Filipe: I’ll contact you via e-mail. I’m so glad you found my site, though. Crystal: I’m from the mountains of Tennessee and having all this seafood so close and so cheap has been incredible for me. I think Chicago is an incredible city, but it would be hard to leave all this crab and shrimp behind.